The territory of Franciacorta includes the Morenic Field which stretches south from Lake Iseo in that part of the Province of Brescia set in-between the Rivers Mella to the East and Oglio to the West and that reaches out to the slopes of the Montorfano Hill. An area of extraordinary beauty which stretches from the banks of Lake Iseo across gentle hills and evocative valleys embellished by ancient villages, medieval castles, patrician villas, churches and remote abbeys. Different theories try to explain the origin of the name of this region, but the most plausible of them has the name Franciacorta descending from "Franchae Curtes". These were communities of Benedictine Monks who took possession of the area during the middle ages and that were granted fiscal exemption due to their work of drainage and reclamation of the land. However, the culture of vines and wine production in the land of Franciacorta are much more ancient than the name of the region itself. The first traces of this longstanding activity date back as far as pre-historic times and continued up to today, withstanding the different invasions and occupations witnessed by this area in centuries of history. A tradition of vine culture which spanned across several millennia and that has succeeded in recognizing the production of the Spumante di Franciacorta as the true vocation of this land. The testimony left by doctor Gerolamo Conforti (a physician of the 16th century) back in 1520 in his "Libellus De Vino Mordaci" (Dissertation on Sparkling Wine), which describes the wine produced in Franciacorta and praises its soothing qualities, proves the ancient vocation for sparkling wine in Franciacorta. The territory of Franciacorta as it is today is the result of an ancient and glorious past as well as of the enterprising and laborious nature of its people who have contributed to the modern development of the region with their work and tenacity. The extraordinary wines produced in Franciacorta carry with them this ancient history as well as the beauty and the soul of this land, thus becoming ambassadors for the name Franciacorta in the world. The Biondelli family estate is located in Bornato, an ancient town nestled at the heart of the Franciacorta region. The centre of the wine estate, which stretches across various pieces of land, lies in a 16th century farmhouse located in front of the historic medieval castle of Bornato (today's villa Orlando) and at the inception of the charming Longarone Valley, settled in-between the villages of Bornato, Cazzago San Martino and Calino. The same palaces where in 1438, during the war between the Duchy of Milan and the Republic of Venice for the control of the territories of Brescia and Bergamo, the troops from Milan under the command of Nicolò Piccinino fought against the venetians soldiers leaded by Antonio Martinengo from Brescia and Erasmo da Narni, better known as "Gattamelata" (one of the greatest military leaders of the Italian Renascence). The estate, known as "Breda" (a term deriving from the Latin "proedium" or from the Lombard "braida" and which indicates an estate consisting of different pieces of land distributed around a central farmhouse), was acquired during the aftermath of the second world war by Giuseppe Biondelli, Italian Ambassador to be and Italian Consul General in Innsbruck (Austria) at that time. To such regard, a particular destiny seems to have brought this ancient rural estate close to the world of diplomacy on several occasions. As a matter of fact, prior to becoming property of Ambassador Giuseppe Biondelli, the estate belonged to Count Alessandro Fè d'Ostiani (1825-1905), Senator of the Italian Kingdom and Minister Plenipotentiary (a Diplomatic Envoy) in China, Japan, Brazil, Belgium and Greece. The estate then passed down to his daughter Paolina who married Count Charles Jean Tristan de Montholon Sémonville (1843-1899) who was also a diplomat and became French Ambassador to Switzerland. These traces of a glorious past that saw Bornato as a crossroad of European diplomacy for a century, set the foundation for the will and aspiration of the Biondelli family to bring the wines of Franciacorta far beyond national borders. With this goal at heart, the ancient farmhouse has been completely restored and further developed, with the construction of an underground wine cellar, in order to establish a modern structure to process at best the different types of grapes (Chardonnay for the Spumante di Franciacorta and Cabernet Sauvignon, Cabernet Franc, Merlot, Nebbiolo e Barbera for the Curtefranca Rosso) following the specific vocation of the different pieces of land that form the estate. The century old commitment of the Biondelli Family in the agricultural sector has allowed the development of a strong feeling of attachment to this land and a great attention to the conservation of the environment. This vision has been implemented by Cantine Biondelli in order to minimize the environmental impact of the production activity and to guarantee the highest quality of the wines produced. In 2010 they have started the conversion of the cultivation of their vines to the Organic Culture criteria, which in Italy takes about three years. This process, monitored and certified by the Mediterranean Institute of Certification, involves the exclusion of the use of pesticides and fertilizers in the treatment of vines as well as imposing a considerable reduction of the percentage of sulphites (the additive used for the preservation of alcoholic beverages) in the final product. A path that requires considerable effort and great attention in every phase of the production, but which allows the elimination of the dispersion of potentially harmful substances into the environment and the reduction of their presence in the final product. With this choice, Cantine Biondelli therefore offers a higher quality level of their wines, radically limiting the environmental impact of their activities on the surrounding territory. Bornato is an ancient rural town nested at the heart of Franciacorta. Its territory originates from a hill which gently gives way to a beautiful valley that separates Bornato from the bordering towns of Cazzago San Martino and Calino. Even if traces of the first settlements in this area date back to the Neolithic age, the dawn of Bornato is to be set with the arrival of the Cenomani Gauls in the IV century B.C. As a matter of fact, the origins of the name Bornato itself are to be found in the Celtic word "bor" (wellspring) which refers to the numerous water springs that are still present in the area. With the arrival of the Roman occupation, the area increased its relevance and Bornato evolved into an important "pagus" (an administrative district of the rural territory). The strategic importance of the place is clearly proven by the Roman fortification (the original core of the following medieval castle) that guarded the consular road between Brescia and Bergamo. Following the fall of the Roman Empire, the town continued to grow, first around the Lombard church, and then around its medieval castle, which originally belonged to the Bornati family (the ancient feudal lords of the area), thereafter. After becoming part of the domains of the Venetian Republic rural activities in the area rapidly expanded and several patrician villas were built around the ancient town centre. These villas were used by the notable families of Brescia who owned land in this area, both as countryside retreats and administrative centres to manage the rural estates. In this period Bornato was already celebrated for its fine wines as described by Ottavio Rossi (a scholar and official antiquary of the City of Brescia, Brescia 1570-1630) in his Memorie Bresciane (History of Brescia) edited in 1611, where the town, as well as other centres in Franciacorta, is reported for its "eccellentissimi" (most excellent) wines. A confirmation of the judgment expressed in 1610 by Giovanni da Lezze Count of Croce and Governor of the City of Brescia (Venice 1554-1625) in his "Catastico Bresciano" (an account for the Venetian Senate concerning the territory of Brescia) where he refers to the perfettissimi vini ("most perfect wines") produced in the area of Cazzago San Martino, the neighbouring town with which Bornato was joint in 1927. Between the 19th and 20th century, the town indirectly gained international prestige according to the presence among its citizens of Count Alessandro Fè d'Ostiani (1825-1905), Senator of the Italian Kingdom and Ministry Plenipotentiary in several countries (China, Japan, Brazil, Belgium and Greece), as well as of Count Charles Jean Tristan de Montholon Sémonville (1843-1899), husband of the daughter of Count Alessandro Fè d'Ostiani and French Ambassador to Switzerland, and finally of Ambassador Giuseppe Biondelli (1890-1972), who, following his marriage with Clementina Maggi di Gradella, decided to purchase the estate of the Counts Fè d'Ostiani to use as his family's summer retreat. 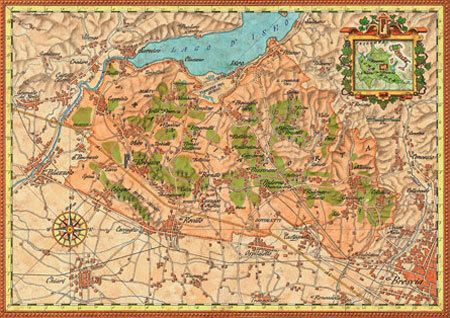 Today Bornato is one of the most fascinating areas in Franciacorta. The town was capable to maintain through centuries its charming looks of an ancient rural town. The evocative town centre, embellished by the medieval castle (today's villa Orlando) and by a number of patrician palaces and villas, is framed by a rural landscape of vineyards and secular woods. Bornato has an enchanted feel to it that, just as it won over the heart of Arturo Benedetti Michelangeli, the famous piano player who bought a villa in Bornato during the sixties, never fails to charm whoever comes to visit it. The origins of the Biondelli family are to be found in the city of Piacenza (a town in the North of Italy) where the family was part of the city aristocracy during the period of the ancient Duchy of Parma, Piacenza and Guastalla. Strongly involved in the silk trade and owner of considerable estates in the region of Piacenza as well as in the bordering Duchy of Milan, the Biondelli family was also involved in the administration of the city under its different rulers with its members serving as treasures of the community for three generations (from 1737 to 1804). It was with Giuseppe Biondelli, born in 1890 in Pesaro, in the centre of Italy where a branch of the family had moved following the national unification of Italy, that the path of the Biondelli family came to cross the territory of Franciacorta. After serving as a young diplomat in China (Shanghai and Hong Kong) and as Consul General in the Principality of Monaco as well as Liverpool, Berlin and London during the challenging years that preceded the Second World War, Giuseppe Biondelli arrived in Franciacorta following his marriage with Clementina Maggi di Gradella. It was, in fact, due to his wife deep love for this region (the Maggi family had ancient ties with Franciacorta) that he decided to purchase in Bornato the villa and the rural estate which had once belonged to the Counts Fè d'Ostiani. A decision supported by his personal appreciation of the beauty of Bornato as well as by the proximity with the residence of Count Aymo Maggi, founder of the legendary "Mille Miglia" car race, who was cousin to his wife Clementina. Upon being appointed Ambassador, Giuseppe Biondelli chose Bornato as his family's summer retreat and developed his rural estate with the implantation of the first vineyards. Giuseppe's son, Carlottavio Biondelli, strong of a longstanding personal commitment to the agricultural sector, decided to further expand the tradition of vine cultivation on the estate and to develop the wine cellar as it currently stands by refurbishing the 16th century farmhouse located in the heart of the rural estate. Today Carlottavio, with his wife Mariella and his sons Francesco and Joska, runs the wine business with the same passion and devotion that through time has always denoted all of the members of the Biondelli family.